Why am I finding condensation in my dryer? I live in Houston, TX (Very Hot, Very Humid). In the summertime, my dryer is dripping with water, when not in use. I do not have overly excessive drying times. My dryer is vented via an unfortunate run of over 25 feet with two elbows. It exhausts through the roof. Dryer is in the center of the first floor, so the vent goes up to the second floor, runs through the ceiling/floor, comes out in an attic and through the roof. 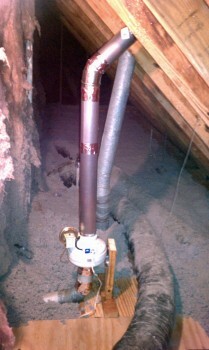 The attic is unfinished, with temps well over 120F on an average summer day in Houston. My guess is that I have hot moist air pouring down my dryer duct, hitting my nice cool air conditioned dryer and condensating. Initial google searches have pointed me at the Fantech DBF110 which is a booster fan that you install on your duct run. I'm not certain this is going to solve my problem, as it doesn't run constantly, only when the dryer is running. Would I get more bang for my buck by insulating the duct and trying to seal it up? Any recommendations on materials if that's the case (thermal blanket, just wrap fiberglass, other)? As Eric suspected, I didn't have a working flap on my dryer vent. So I bought one and gave it a test run and I wasn't happy with how little the flap opened from the pressure on the dryer. So, I installed the booster fan as suggested by Doresoom as well. We had a few hot humid days after that, dryer stayed dry. My clothes drying times are pretty low too, 30-45 mins. Fan pic is before I cleaned up the electrical, looks a little neater now. The ideal install for that fan is with the bracket on a stud, unfortunately there was no good way to attach a stud and avoid cutting a new hole in the roof. Luckily the fan is pretty light. Usually a dryer vent will have a spring loaded flap where it exits the house to prevent outside air (and bugs, rodents, etc) from coming in through the pipe. If you are getting airflow from outside through your vent pipe, it sounds like either you don't have one or it isn't closing. I would check that first. Depending on the type of duct you have, 25 feet and two elbows may be near or over the length limit for dryer vents without a booster fan. This website lists the limits. Not the answer you're looking for? Browse other questions tagged ventilation ductwork appliances or ask your own question. Can a dryer be vented through the roof? How can I modify this dryer vent cap to keep lint from getting trapped? What are my options for venting a bathroom exhaust fan? How would you vent my basement bathroom fan? How much heat loss through bathroom fan vent? Should I vent my bathroom exhaust fan through the soffit or the roof? 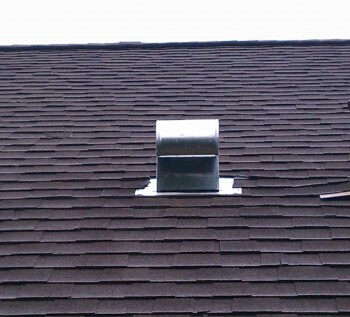 Do we need a gable vent, and in either case, how to vent bathroom fan outside (can it be via the gable)? Can a bathroom fan go out a ridge vent, and how functional is this temporary fix?